Full-sized, full-immersion soaking is yours with the Mermaid 5.92 ft. Centre Drain Soaking Tub in White. A chic rounded design and bright white finish produce a dramatic effect on this freestanding bathtub, sure to enrich your bathroom ambience and leave a lasting impression. This unit includes a floor-mounted single-handled brushed nickel faucet along with overflow and drain outlets in brushed nickel to complete the setup. The acrylic construction is strong, light and warmer to the touch than typical steel or enamel tubs, allowing for easy installs and heat-retaining soaks. 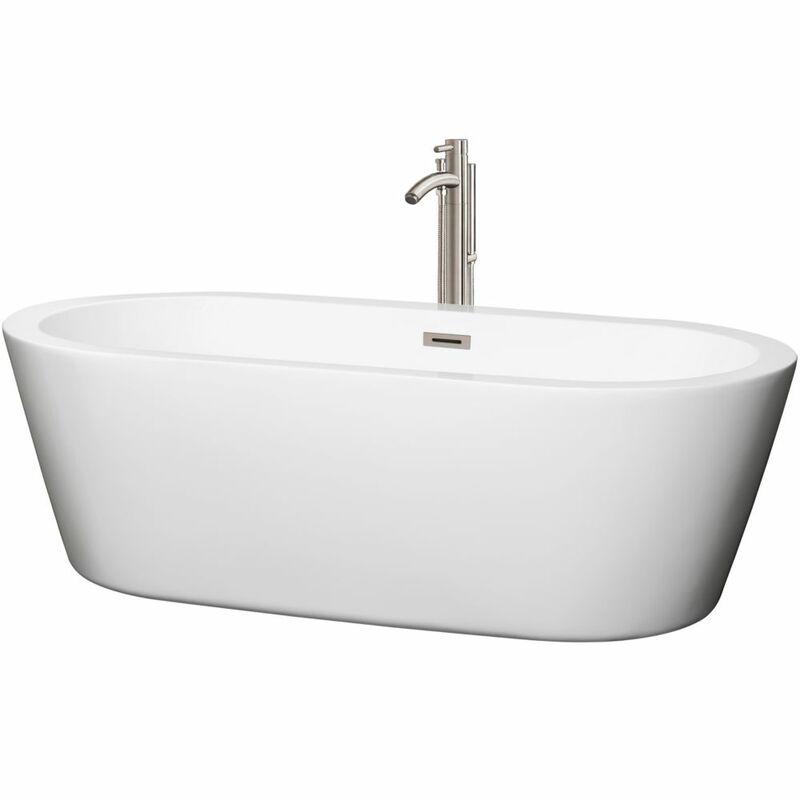 Deeper than your standard tub, the Laura 5.58 ft. Centre Drain Soaking Tub in White allows for full-immersion luxury soaking and supreme relaxation. Contemporary styling and clean lines contribute to the freestanding bathtub's modern aesthetic, sure to enrich your bathroom ambience and add a hint of serenity. This unit includes a floor-mounted single-handled chrome faucet along with chrome-finished overflow and drain outlets for a polished look. The acrylic construction is strong, light and warmer to the touch than everyday steel or enamel tubs, allowing for easy installs and heat-retaining soaks. Mermaid 71-inch Acrylic Centre Drain Soaking Tub in White with Floor Mount Faucet in Brushed Nickel Full-sized, full-immersion soaking is yours with the Mermaid 5.92 ft. Centre Drain Soaking Tub in White. A chic rounded design and bright white finish produce a dramatic effect on this freestanding bathtub, sure to enrich your bathroom ambience and leave a lasting impression. This unit includes a floor-mounted single-handled brushed nickel faucet along with overflow and drain outlets in brushed nickel to complete the setup. The acrylic construction is strong, light and warmer to the touch than typical steel or enamel tubs, allowing for easy installs and heat-retaining soaks. Mermaid 71-inch Acrylic Centre Drain Soaking Tub in White with Floor Mount Faucet in Brushed Nickel is rated 5.0 out of 5 by 1. Rated 5 out of 5 by Ashtrost from Excellent tub and faucet! After an extreme amount of research, I ordered this tub and fixture. It was been perfect. Very comfortable and big. The plumber had no problem installing the tub and faucet. It was installed on the second floor, which made it easier to install. We are extremely pleased with this tub. Very easy to clean, especially with the hand sprayer. I recommend this tub to everyone!